"We all have a personal relationship with God that no one else can dictate." I had this idea fall on my heart after talking to a friend who was just accepted into law school. While I was elated for her, a part of me demonstrated anger and jealousy because of her success. Seeing my friends go out in the world and do great things often times leaves me thinking that I'm a failure. But, as God's peace fell on me, I realized (1) that I was dope in my own way and (2) the significance of the 'personal relationship' that we each have with God. Simply put, what works best for my friend may not work for me. What God has for me, it is for me. It just becomes a matter of me developing the faith necessary to receive His blessings. Each of us has to decided how much faith we will present to God, especially when it comes to Him revealing His plans for us. When I say that I "believe in Him", that means more than just saying that I believe that He exists. It means that I love Him even when I don't feel Him; that I trust Him even if I'm in a storm, that I'll follow Him even if His will isn't always clear. II Corinthians 4:17-18 teaches us that personal struggles/hardships are only temporary and that they work for a greater purpose than what I see right now. In essense, just because your blessing is not in arm's reach, doesn't mean it's not there. I had an interesting conversation with a lady who attends my church. We'll call her "Johnita Moore". Johnita is one of those "traditional" Christians. You know, the ones who are always pontificating to the younger church goers; using the "decent and in order" scripture to push their church norms, and blindly follow the concept of traditionalism in the church. Yeah. That type. At any rate, talking to her made me realize that I'm not a typical Christian. For a long time, I believed that 'church folk' could do no wrong. Now I'm starting to see that it's often the church folk who get it twisted the most. We tend to lose sight of "the least of these". Isn't the church supposed to tend to those in need; as opposed to being critical and judgemental of them? Much like this picture, the church often creates a gate of superficiality where some types of people are excluded. Before you argue with me, what happened the last time a drunk person wandered into your church? Maybe one of my biggest gripes is that most of the sins/actions that church folk have the hardest time getting past are usually those that they have committed themselves. So, my advice to the Johnita Moores of the world is to search your own heart to see if you need to clean yourself up before downing other people for their shortcomings. I've seen people torn down by the church in the name of religion, when it could have very easily used the word of God as a tool of ministry instead. I've noticed something I call "church culture". I doubt that it's a new concept that I made up, but I see it all the time. It's the scary notion that people have to assimilate to be just like each other in the church. If a person doesn't match that mold, they have a hard time fitting in. I think that's why it's important to realize that God calls for us to conform to Him, not to the church (Romans 12:2). There's a huge difference, no matter what people might say. We have to learn to accept people where they are. We may not agree with all they do, but we have to respect them nonetheless. Having this spirit is not an impossible chore. After all, Christ deemed us free will moral agents and we should act accordingly. He NEVER forces His will on anyone. Yes, there are consequences for not obeying His will but -- bottom line -- Jesus gives us a say in how we live. After months of anticipation and preparation, two friends finally married. For the record, they're not the people on this magazine cover. I just thought this image would be a cool addition to this post. At any rate, whenever I watch people marry (especially if I'm involved in the ceremony) certain questions always seem to raise in my head. For instance, I often ask myself "When is right for me to marry?". As I see ads in the phone book for divorce, it's clear to me that society doesn't view marriage as God does (see I Corinthians 3:18). People don't always realize that a successful marriage first starts with personal communion with God. This intimate relationship with Him allows us to answer questions about things that go into marriage (not just "love"). 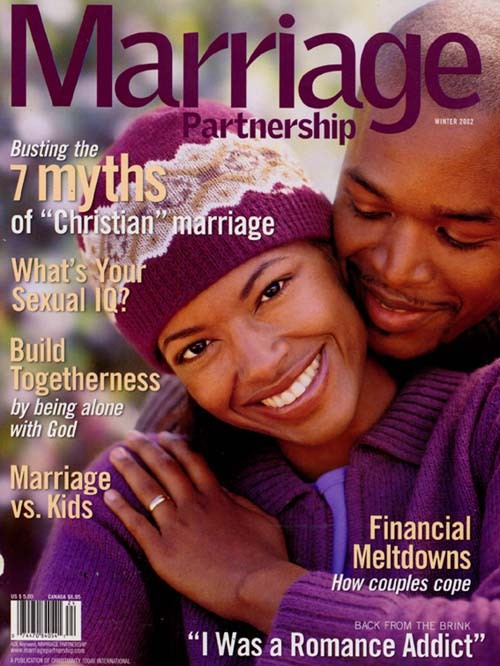 (1) Being equally yoked: The Bible teaches us not to be bound together with unbelievers. Harmony in Christ can't exist when half of the relationship doesn't even follow Him. Take Tauheedah, my last official girlfriend: I mean, this girl was DOPE! Pretty, intelligent, socially conscious. Just an all-around girl. Except...she was Muslim. Not to hate on Muslims (we're all free to worship as we please); but there was no way that I, as a Christian, could expect to connect with someone who viewed Jesus as "just a prophet". You either follow Jesus or you don't. Having one of both types in a marriage is destined for failure, no matter how open-minded they are. (2) Familiarity: Christian couples, I believe, must be able to recognize the levels of familiarity that they have with one another. Where are they spiritually? What are their views on child-rearing? On the roles of men and women in a marriage? On finances? 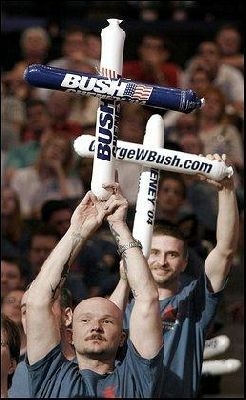 On their dedication to Christ? As we find mates, familiarity and commitment to one another must be proven, not just offered as lip service. (3) Recognizing marriage as a covenant: Not only is marriage a commitment to one another, but it's also a covenant (or agreement) with God. It's a promise to remain faithful to your mate until the end of your life--or theirs; whether you're rich or poor, healthy or sick, attractive or...well...not-so-attractive, exciting or boring. Christian marriages should be able to endure the worst of circumstances from anger to depression to sexual dissatisfaction. The Bible teaches us that all things are possible through Christ. This certainly holds true for marriage. Well, summer's officially gone. This season has definitely been one of enlightment for me. After spending months questioning myself and my views on other people (particularly those with whom I've had emotion investment), I've come to accept that there comes a point where faith in them just won't come naturally. I'm starting to recognize the different levels of friendships that I have as well as when their seasons have ended; although it's hard to do at times. I always seem to want more or less from each of my relationships; only to wind up disappointed if they don't turn out the way I want. I suppose that I need to set my expectation of people at least one notch higher than their track record. That way, I won't be suprised or hurt if their "old self" resurfaces. This must be the type of thinking that develops when a person gets hurt over and over. Don't get me wrong: I don't think that people hurt me intentionally; but they have done so nonetheless. While I think it's healthy - and Christ like- to forgive, I won't put myself in a position to be hurt by the same people time and time again. I see no purpose in that. 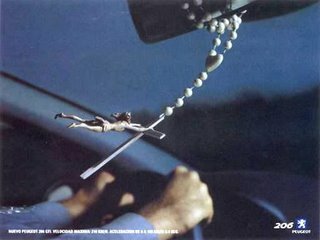 A friend of mine sent me this picture as a reminder to slow down while I'm driving (if this doesn't do, those @#$! speeding tickets will). But this picture, in an odd sort of way, makes me realize so much more. Life can get crazy at times. It's important to remember to slow down if you feel like life is going too fast. Much like that depiction of Jesus barely holding onto the cross, so it is with my faith at times. It can be to the point where we feel like calling it quits and just letting to. But what I've come to realize is that if I continue strong in my faith in God, family, friends, and anything else I hold dear to my heart, I'll never let it go. I`ve learned the hard way that, at the end of the day, all we really have are our integrity, our character & our faith. It`s what we do with those things that matter most.